I remember when the first GPS watch came out. I was in college and my dad gave it to me as a gift. It was brick sized and I used it to track my epic two to three mile jogs. I loved it and it was the coolest thing around. Fast forward a dozen years later and now it’s almost data overload. I talk to athletes all the time who are overly focused on, say, ground contact time, or SWOLF score when they should be worried about getting to the pool three times a week and working up to consistent running first! So let’s get back to basics. With all the metrics available, let’s explore a few key things to keep in mind as far as generating meaningful data for both you as an athlete and for a coach who you may report to. I will give you a few general principles I keep in mind for myself and for others. You need data to build an honest history. Otherwise that history can morph into remembering your marathon as ‘under three, high twos’ when it’s really an hour slower. How so? Our memories are fallible and misremembering past times will color your future training and define your expectations in an unhealthy way. Why does it matter? Because someday you will look back at that data and be very angry that you somehow magically ran a three hour marathon when in fact you run a four hour marathon and so forth. And in the happy event that it works out the other way you see that you’ve improved greatly you will want to be able to look at an accurate training log to see how you get there. This also applies if you’re not in a position to analyze your data now. Maybe you’re planning on getting serious for a big goal race next year and just training for general fitness this year. It will still help your future self to reference this year’s efforts. Use data in a way that doesn’t drag you into a negative emotional state. For example, if you have trouble making easy runs easy, then you might consider ditching the watch for easy efforts and only using it for tempo and interval efforts. Otherwise you can become obsessed that this week your ‘easy’ effort is a 10 minute mile and last week it was a nine minute mile. Sounds crazy but it is more common than you think. While being obsessed with data can be negative, one exception is testing. You must test in order to know if you are improving, but you do not want it to have a negative impact. The solution is to set yourself up so that your test will be a successful one. There are two components that aid in successful testing. First is to not test when you’re exhausted. This is relatively simple to achieve. The second component is not to set unrealistic expectations. An example situation would be harboring an unconscious belief that if you don’t get achieve X goal you are not improving fast enough or that you should give up. Every endurance sports has it’s own unique set of metrics and numbers that can be useful. Let’s look at how to make data mean something in all three sports. In cycling the gold standard of measurement is power which is objective. Secondary, or ideally in conjunction with this metric is heart rate. Input and output will show you the work and how you’re responding. Speed is a terrible metric to use. There is little reason for a triathlete to look at speed unless they have some sort of bet riding on the line. Use power and heart rate during training. During your race, go primarily by heart rate and have a power range your will seek to adhere to instead of arbitrary magical number. Always zero your power meter. Failing to do so with make your data invalid and invariably lead to the aforementioned “I once did something I didn’t really do” scenario. Select include zeros in your measuring device. Sure, it looks cooler to have a higher number without zeros but the fact is you did coast so it’s telling you a white lie. “Keep your power curve clean” by only including data from one recording device. Many devices are precise to themselves but their accuracy from one to another varies. It does you no good to hit 200 watts on a 20 minute benchmark effort, then hit 220 watts on your indoor trainer. Not only are you not necessarily not better, you won’t even know if you’re better which can be worse. While the technology exists to track every lap of your swim, to utilize drill mode, to play swim GOLF with reckless abandon without having to count strokes, and myriad other functions, do you really need it? Let’s be honest. It’s anathema to suggest to a ‘real’ swimmer that they use a swim watch. So I would say it depends. I don’t usually a push using a watch to a former high school or college swimmer who can lap me on a 200. But using the basic functions of a swim watch can help you drive yourself to work towards continuous improvement. If you swim alone alone and tend to be the type of person who times hundreds by gazing at a distant wall clock with foggy goggles after leaving on the :37, then reports their 100s as ‘about’ 1:30’s, then you could probably benefit from a swim watch. If you swam as a kid and can recite your lifetime PRs in different age groups and regularly swim in a masters or other structured program with other motivated adults, then it might not be necessary. 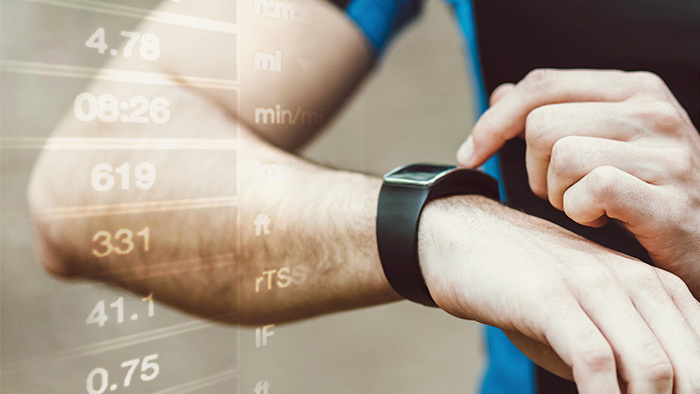 Running watches have come a long way since the original Garmin and are a pretty common technology for runners whether they consider themselves ‘serious’ or not. I will typically advise competitive people to ditch the watch if they tend to worry about hitting a certain pace on their easy runs. I love it, but it can be bad if you tend to get overly caught up in running faster than your friends. Run easy without fear. And don’t be the person who has to explain why they’re not hitting their race pace on easy run in the title of their workout session. So while the technology is out there to track literally every step, stroke, heartbeat, mile, etc., it’s not of equal importance. Take the time to truly look at what data is important, and how you mentally and physically respond to using data. Meaningful data collection and analysis can drive your performance to a new level. Bethany is a USAT certified triathlon coach with an M.A. in Health Science/Health Promotion as well as graduate training in Counseling. She is one of the Atlanta Tri Club partners and owners of Energy Lab, a coaching and cycling studio in Atlanta, and serves on the USA Triathlon Southeast Regional Council as the Technology coordinator. Bethany has been coaching both individuals and groups in running and triathlon for several years now. She also serves on the USA Triathlon Southeast Regional Council as the Technology Program Manager.She is also a freelance writer, contributing regularly to the training section of Triathlete Magazine, co-author of the recently published 180 Your Life from Tragedy to Triumph: A Woman's Grief Guide and various other publications.A two time IRONMAN World Champs and 70.3 World Champs Qualifier, and perennial USA Triathlon All American, her personal focus is the Ironman distance. In the 2015 USAT Rankings she was ranked 6th in 30-34 in the SE, and 3rd in the state. She was also ranked 4th in the country for 30-34 in the 2013 IRONMAN 70.3 Age Group Rankings. Her favorite mode of exercise is running with her two vizslas, Sadie, and Bailey.